The Oliva Serie V is a cigar line made its mark among cigar enthusiasts. It built its popularity started when it was released in 2007, and while there have been many flashier blends to hit the marketplace, the Oliva Serie V still hangs in there. In 2011, a petit corona vitola was introduced to this line. This petit corona was originally targeted to be a more limited release, but has managed to make its way across the marketplace. This vitola -the Oliva Serie V No. 4 proved to be a very fine addition to the Oliva Serie V line. As a result, Cigar Coop ranked this particular vitola as our #2 Best New Vitola for 2011. The Oliva Serie V No. 4 was introduced in 2011. It was originally going to be a limited release cigar targeted at TAA (Tobacconist Association of America) shops and the European market. Given the European market usually targets smaller, thinner ring-gauge cigars, it made sense to target Europe. However by the second half of the year, this vitola has started to pop-up more mainstream in U.S. retailers. In the end, while I am someone who prefers a much larger cigar, the Oliva Serie V No. 4 won me over. Let’s take a closer look at this cigar. 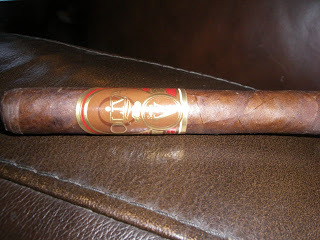 The Oliva Serie V blend is an all-Nicaraguan puro. It is highlighted by its high priming sun-grown wrapper. As I mentioned, the sun-grown wrapper is a highlight on this cigar. It has a chocolate colored wrapper with a some veins. The cigar I used for this assessment had already managed to have a tiny bit of plume on it. The classic Oliva Serie V band goes around the No. 4 vitola – it uses gold lettering on a brown background. There also is some red color in the band. As I usually do, I opted to place a straight cut into my Oliva Serie V No. 4. The prelight draw provided me notes of chocolate, floral, and herb notes. These floral an herb notes had a very natural tobacco taste to them. I was definitely satisfied with the dry note flavors I got from the No. 4, so it was time to light up this petit corona and see what was in store. The initial flavors from the Oliva Serie V No. 4 continued to provide me a dose of chocolate and floral notes. Early on, I detected some pepper spice. While the chocolate and floral notes swere in the forefront early, the pepper notes slowly increased. By the end of the first third, the chocolate, floral, and pepper notes were all balancing each other well. The secoond half of the cigar experience saw the flavor profile of the chocolate, floral, and pepper notes alternate as to which flavor would be in the forefront. Toward the close of the smoke of the Oliva Serie V No. 4, the pepper spice would win out. While the fiinish was spicy, it was not harsh. The resulting nub was soft and slightly warm. Overall, while I’m not the biggest fan of floral notes, it somehow works well with this flavor profile – namely because they had a very natural tobacco taste to them. The burn of the Oliva V Serie No. 4 was textbook Oliva V – namely there were really no issues to mention. The cigar burned straight requiring minimal touch-ups. The burn rate was ideal, and while it was a little warm on the finish, this was nothing to really complain about as the cigar burned at an ideal temperature throughout the smoke. The draw was outstanding – making the Oliva Serie V No. 4 an outstanding smoking experience. The Oliva Serie V line is known for its full, bold smokes. The nice thing is the small vitola of the Oliva Serie V No. 4 continues with that tradition. While I’d stop short at saying the cliche “this little cigar packs a punch”, this is still definitely a full-strength cigar from a nicotine profile standpoint. As for the body, the flavors are robust – definitely qualifying the No. 4 as a full-bodied cigar. The strength and body of this cigar balance each other perfectly which each attribute contributing equally. Overall, I still think the larger ring gauge of the Oliva Serie V line delivers a lot more in terms of flavor, but I cannot take away from what this petit corona delivers. There is a reason why this was ranked as our #2 New Vitola for 2011. The flavors are good, and the heritage full strength and body are preserved in this line. I would not hesitate to recommend this to an experienced cigar enthusiast. Large ring gauge enthusiasts are going to have a tough time with the small size – but in the way, this is a general problem with petit coronas and not specific to the Serie V No. 4. If a novice enthusiast wants to gravitate to a full-strength, full-bodied cigar, this might be the perfect place to start. As for myself, while I’m not the biggest petit corona fan, this one was very good and I would smoke it again. Source: This cigar was given to Cigar Coop as a gift by a friend.